only 1 hour and 40 minutes until our winter holiday break begins. Ha! Great photo Beth – are those lemurs? Have happy Christmas. Best to you and yours. I am so excited for you! ENJOY!!!! The image says it all. 🙂 Have a great break and Happy Holidays! Merry Christmas, Happy Holidays and a Very Wonderful New Year Beth!!!!!! Yay! What a wonderful time! A good holiday to you! Enjoy your time off! Happy holidays to you! You have some really good posts, Beth. It is good to come to your blog and visit. This post was good … “and some may be feeling a bit differently.” Hey, have a great Christmas (in the event that I don’t get back this way before Yuletide. 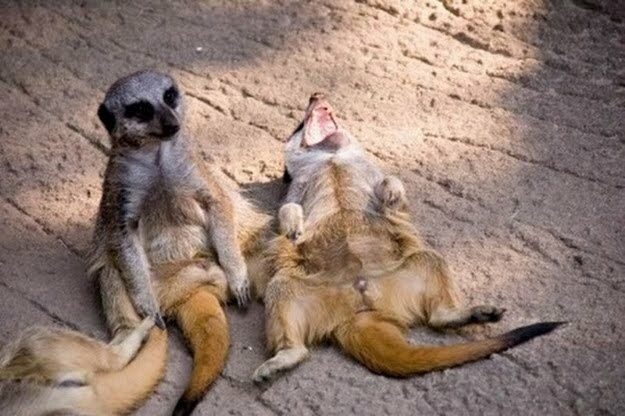 I can’t tell if the meerkat is laughing hysterically or just collapsed from fatigue. But I can relate either way, Beth. 😉 Merry Christmas and Happy New Year. now, ain’t that the truth? sharing! <3!